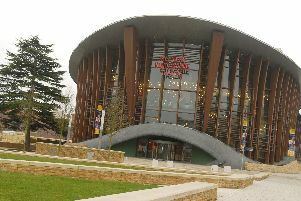 Ballet fans are in for a treat with plenty to entertain them at the Waterside during the new season. Swan Lake, Nutcracker and a typically innovative Northern Ballet production are on the programme. And for those who prefer a different style of dance, there are musicals and one night shows with lots of dance content. The Saint Petersburg Classic Ballet return to Aylesbury with a magical production of one of the best loved Russian ballets, Swan Lake. Tchaikovsky’s masterpiece is a tragic tale of love and betrayal accompanied by a glorious and instantly recognisable score. This is the epic story of Prince Siegfried and his love for Odette who, tricked by the evil sorcerer Von Rothbart and his daughter Odile, would rather die together than live apart. Swan Lake will be at the Waterside at 7.30pm from Thursday, February 2 - Saturday, February 4, with an additional 2.30pm matinée on the Saturday. Tickets from £15. In March, up to 100 talented young dancers from our area will join eight professional principal artists to present the English Youth Ballet’s production of Nutcracker Suite. The EYB is an exciting and progressive company that gives aspiring ballet students an opportunity to perform and showcase their talents on a major stage in a classical ballet production. Well established and in their 19th year, the concept has proven so successful the company has been honoured for their outstanding work. In the Nutcracker Suite, the Prince escorts Clara to the Kingdom of Sweets where she meets the Sugar Plum Fairy. Spectacular dances, each representing a sweet, are performed in her honour. The ballet will be performed at 7.30pm on Friday, March 24 - Saturday, March 25, with an additional 2pm matinee on the Saturday. Tickets from £17.50. In June (9-10) the Northern Ballet presents The Boy In The Striped Pyjamas, a heartbreaking story about an unlikely friendship during the Second World War. Tickets from £10.50. If you prefer dance of a different genre, Thoroughly Modern Millie comes to the theatre on March 27 - April 1 starring Strictly Come Dancing glitter ball winner Joanne Clifton as flapper Millie Dillmount in Jazz Age New York City. Tickets from £17.50. And Strictly favourites Anton du Beke and Erin Boag visit the theatre for just one day at 3pm on Sunday, January 29, with Swing Time. Featuring star vocalist Lance Ellington, six world class ensemble dancers and the full 25 piece London Concert Orchestra. Tickets from £30. For further information on all these shows and many more and to book online go to www.atgtickets.com/aylesbury or call the box office on 0844 871 7607.